ZincStar is a high performance, premium cropping fertiliser for use on winter and summer crops. ZincStar is a compound granule containing MAP and zinc. The product is created by adding zinc to MAP during the granulation process with zinc delivered in every granule. 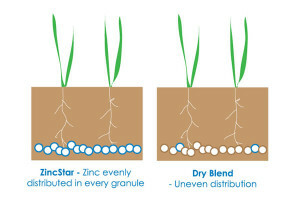 ZincStar improves plant uptake of zinc by the even distribution of zinc at the root zone. Blends with the majority of fertilisers. Ammonia gas is combined with phosphoric acid and zinc, granulated, dried and screened. One of the major cropping fertilisers used in Australia as a source of phosphorus, nitrogen and zinc. The low level of N makes it useful as a ‘starter’ fertiliser and as there is little free ammonia, the risk of affecting germinating seeds is minimal. Will store freely in flat storage for extended periods with little concern about moisture uptake. Covering with a tarp will reduce any moist air uptake. For sowing there is little risk of affecting germination, even at high rates. As a general rule, a maximum of 20kg/ha of nitrogen at seeding of cereals should be used. When applying ZincStar, the fertiliser should be banded 5cm away from the seed, either below or to the side. ZincStar is low in sulphur. It is not recommended for high sulphur requiring crops such as canola, unless blended with sulphate of ammonia or other sulphur source.